Also known as permanent makeup,micro-pigmentation or dermal pigmentation , is the art and science of implanting pigment into your skin. The application of permanent cosmetics requires the use of of specialized equipment by a trained and experienced professional of many years. 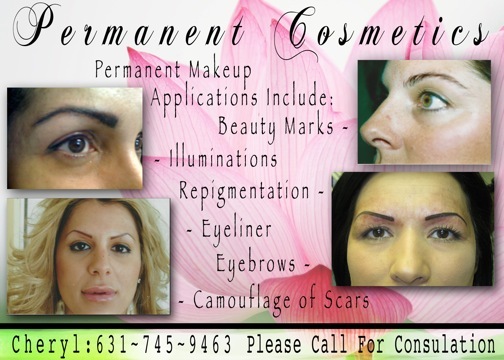 Applied correctly , permanent cosmetics can enhance your natural beauty and can correct any troublesome imperfections. My most common procedure on my clients is correcting eyebrows which are to light or short. Cheryl has specialized in permanent cosmetics since 1995. Working as a tattoo artist since 1989 in illustration and design. She is Licensed and certified by the Suffolk County Board of Health. Ideal candidates for permanent cosmetics are people who have little time to commit to a beauty routine; those who are very active or athletic; are visually impaired or have poor motor skills; (e.g. people with Arthritis, Muscular Dystrophy, Multiple Sclerosis,etc.) or if you wish to camouflage scars; as in areola restoration.